When Vorik was young, he spent several summers exploring the Osana caverns on Vulcan, which included some particularly advanced rock climbing. Like most Vulcans, as a child, Vorik had a young Vulcan girl chosen to be his future wife when the two came of age. In 2371, he was serving aboard the USS Voyager on its mission to locate a Maquis ship when a coherent tetryon beam scanned the Voyager and brought it to the Delta Quadrant. Shortly thereafter, the Caretaker's array beamed the entire crew of the Voyager aboard for testing. He was returned to Voyager unharmed. In 2373, he assisted B'Elanna Torres with maintenance on the plasma injectors during the ship's visit to the Nekrit Expanse. He also adjusted the control interface on Neelix's food replicators and was present in engineering when Neelix came down to steal some warp plasma. Later that year, Vorik surprised Torres by reserving a table for two at Neelix's luau with a view of the lakeside. Torres had mentioned in a conversation five days previously that she enjoyed the view. Later, he worked with Torres and Harry Kim troubleshooting the ship's mysterious engine problems. 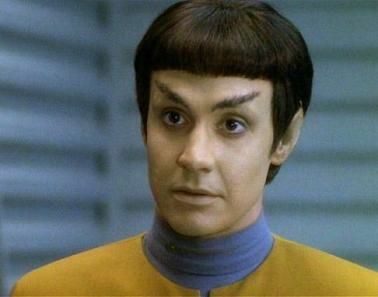 Vorik experienced his first pon farr on stardate 50537. Believing his intended bride would have declared him lost and lacking another Vulcan mate, he declared koon-ut so'lik, the desire to become one's mate, with Torres. After a brief physical contact was made between them, Vorik accidentally initiated the Vulcan telepathic mating bond, which caused Torres to suffer the same neurochemical imbalance that Vulcans undergo. Vorik's pon farr was ended when he and Torres fought in the ritual kal-if-fee. In late 2373, Voyager created an artificial wormhole in an attempt to get home but ended up sliding to the wrong quantum reality. After Joe Carey was reassigned in early 2374 Vorik was promoted to Lieutenant junior grade and named the Assistant Chief Engineer of Voyager a position he has held since. After the promotion of Commander Hwiii and his return to the Alpha Quadrant Vorik was reassigned from his Voyager to the Quirinal to be the Chief Engineer.